Today is special! 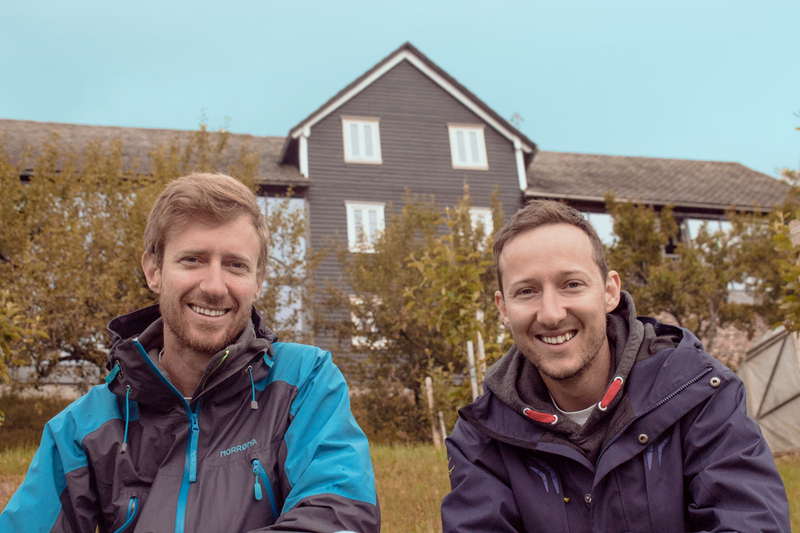 I am very pleased to introduce you to Timothy and Matthew Doms, founders and owners of Doms Biltong. The next months are going to be very exciting as a new brand will be born and the first product launched. I’ll assist the Doms Brothers in terms of business consultancy throughout the entire journey of placing their product on the market. Furthermore I will help them develop an unique brand and visual identity for Doms Biltong, representing the values they stand for. So who are these young remarkable entrepreneurs behind Doms Biltong and what are they going to treat us with? Matthew and Timothy both grew up in one of the most amazing cities in the world – Cape Town in South Africa. Matthews passion for kayaking and the love for outdoors lead him to Voss a few years ago. Timothy now also relocated to Voss and both picked up paragliding as well. Their friends usually tease them by telling them “this town isn’t big enough for the both of you”. Most of the days you can spot them up in the sky flying, other days you’ll find them on the water catching big fish. Voss is now their second home and they decided to bring their favorite traditional South African specialty and share it with us – Biltong. Not only because Biltong is delicious but also because it symbolizes home for the brothers. Back in Cape Town their father taught them how to make Biltong, thus producing it themselves is their family tradition and of course there is also a secret family recipe behind it. If you haven’t tried Biltong yet you are definitely missing out, but no worries, you soon can! Biltong is a 400-year old traditional and popular snack in Southern Africa usually made from beef which is being preserved and dried (not smoked). It is not only a delicious snack but also very nutrient-rich thus perfect to take with you on a long hike or ski tour. The Doms brothers are going to produce handcrafted Biltong using only beef provided by a local farmer here in Voss, means Doms Biltong is 100% Norwegian and you will always know exactly where your meat comes from. Additionally you will be offered a variation of Biltong products suiting your needs best. If you can’t wait to try it we would like to invite you to the first tasting end of this summer. Therefore please get in touch with Doms Biltong. You will also be soon able to follow Doms Biltong on their adventure on social media and I can already promise you great insights and feeds. We are cooperating with Social Media Voss who are going to support Doms Biltong with their expertise in that field. Branding goes far beyond creating a logo or corporate identity. The process of creating a brand is very abstract, as it is not really something you can see or touch. It is more like an impression that lives in your mind or even in your heart. Branding is about developing a certain positive and emotional perception of your company. Good branding should create a recognizable snapshot of who you are and what you stand for. In sum branding is everything that represents you, starting from stationary to customer service. Consistency is crucial in order to communicate your values, build trust and loyalty. If you would like to find out more about branding and the steps involved or book a workshop, feel free to get in touch any time.